The results of this inventory are reported online to schools and districts providing valuable data to be used for school and district technology planning and for federal reporting required of EETT grant recipients. This tool offers educators the ability to identify the technology skills that their Professional Development plan should focus on. This inventory helps teachers to evaluate students' technology literacy within subject area applications. 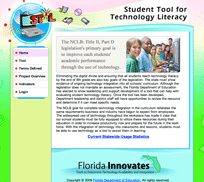 Copyright © 2006 Florida Department of Education, All rights reserved.